The Sermon on the Mount (detail), Heinrich Hofmann; German, 1824–1911; date unknown. 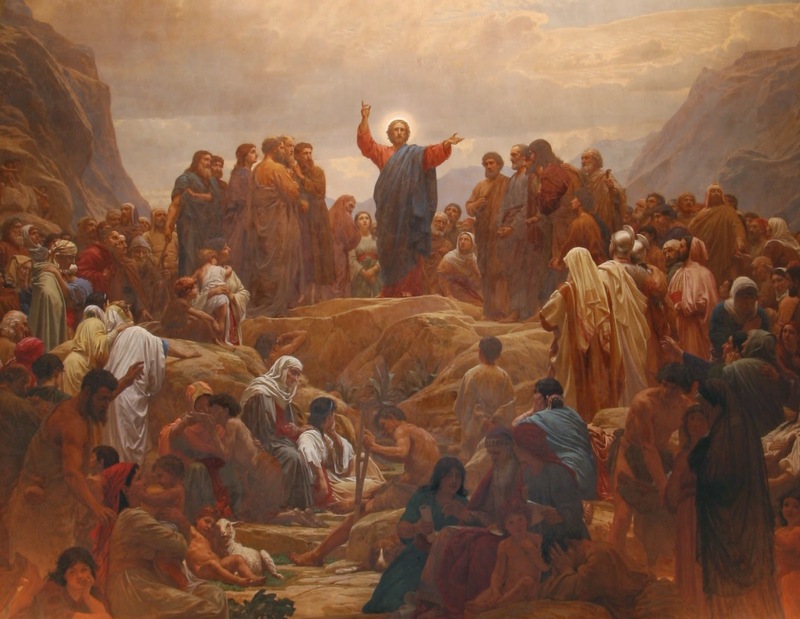 THE Beatitudes (Matthew 5:3−10) are literally and thematically at the center of the Sermon on the Mount. They mark successive steps of the upward course of the spiritual life to its full and final perfection. Each beatitude grows out of all that precede it, and occupies a necessary place in the progressive series. There is not a grace, excellence, experience or duty of the moral life which does not find its place within this series. Poverty of spirit refers to those who have awakened from their self-righteousness to the fact of their self-poverty. Without this conscious and heartfelt awareness of ones limitations and shortcomings, there can be no start, much less progress, in the spiritual life. And it is gloriously significant that with the first step is promised the end: namely, attainment to the grace-led and blessed manner of life which the Gospels call the Kingdom of Heaven. Poverty of spirit leads directly to mourning for sin. One who has become sensible of spiritual destitution soon recognizes the cause of ones inward need. One perceives that it is egoism and selfish attachments which deprive one of happiness and spiritual good. Thus one becomes increasingly sensible of the evil of sin, and sensitive to the miseries resulting from it, in ones own life and in the world at large. In other words, one becomes a penitent mourner for sin in oneself, and a sincere mourner over the dreadful reality and destructive work of sin in human life and society. Out of conscious poverty and penitent mourning grows the meekness of the third beatitude. This meekness is the modest, self-denying and self-restrained spirit which evinces itself in gentleness and forbearance toward others in one emptied of pride and self-sufficiency. These three experiences naturally lead to a supreme valuation of and desire for righteousness — that is, to think, act and live rightly, in right accord with ones own true physical and moral nature, with the Cosmos and Eternal Order, with God, and with ones fellow human beings. And to desire this good above all things else. As the next stage of spiritual progress, the heir of the heavenly kingdom becomes merciful toward ones fellow men. All ones previous experiences conspire to awaken in one a clear sense of their lost condition, their trials and sorrows, their need of sympathy and help. Ones consciousness of ones own infirmities teaches one charity toward the infirmities of others. Ones sense of the supreme importance of salvation from unwisdom and unvirtue prompts one to efforts for their spiritual and eternal good. A realization of ones own imperative need of the divine mercy quickens in one the same spirit of mercy toward all others. Purity is a composite of all the previous graces, freedom from all their opposites. Each of the five contributes to it. In it is the love of all things good, the abhorrence of all things evil. As such it carries with it the vision of the true Good. It is the clearing away of the mists from the soul, and the cleansing of the films from the spiritual eyes. It is easy to see how such qualities as humility, penitence, meekness, desire after righteousness, mercifulness and purity become elements of peace in the soul and influences for peace in the life. They invest the character with an effective power to prevent strife and allay discord. They are the very elements and conditions of peace, whether internal or external. There can be no peace where they are absent; there can be no strife where they prevail. Their opposite qualities are the direct causes of all strife and dissension, and they who are swayed by them are necessarily strifemakers. But the graces of the beatitudes are, each and all, potent solvents of discord, and they who possess them are necessarily also peacemakers, both through conscious effort and unconscious influence. To seek and promote this peace, inward and outward — peace within oneself, peace with God and Nature and peace among men — becomes a free impulse, urge and ordering principle of their lives. Based on the writings of Rev. William Stratton Pryse (1849−1928).